The spiral presentation bouquet with braided, ribbon stems is a historic design of the British Isles. Made larger for an adult and a smaller version for a child; it contains multiple flowers and accents giving it that graceful air. Shown in spring pastels but equally charming in any color combination at any season as it is the many varieties that evoke the royalty & Camelot feel. Fresh or silk spiral bouquet 95. Preserved silk bouquet shipped 115. Presentation spiral bouquet shown is app. 10″+in diameter. 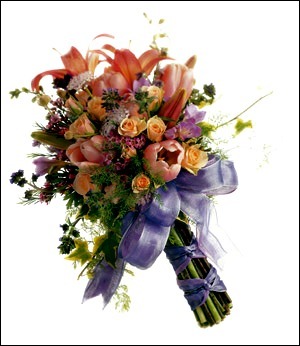 All presentation bouquets made in forever silk flowers can be shipped nationwide.